This section provides what I hope is a good overview of the design and construction of the Motor Launch. Eventually, I hope to include accounts of modifications to the ML's in civilian life after the war. Once the need for the "small fleet of mosquito boats" was recognized the British acted quickly in contracting American companies to provide a solution. 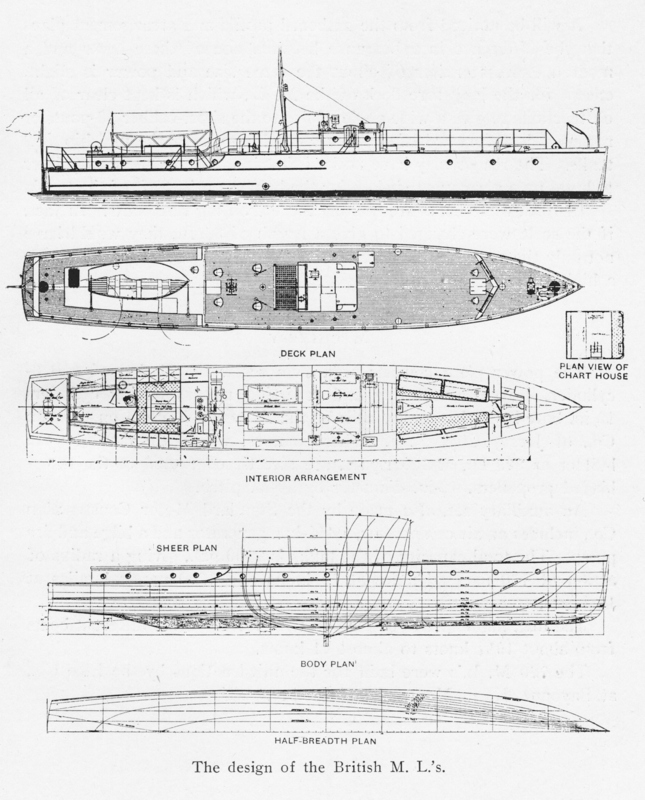 The Electric Launch Company, Elco, was well-suited to the task of quickly turning out standardized, reliable craft en masse. Provided here are a number of lists of particulars, length, draft, tonnage, etc. drawn from two primary sources: The Cinderellas of the Fleet and Jane's Fighting Ships 1919. Nutting includes a general set of lines drawings for the Motor Launch in The Cinderellas of the Fleet that I've scanned and included here. Bill Swanson, Elco historian tells me that these are probably the only such drawings in existence unless the Admiralty happened to document an ML as part of their commisioning process (in which case someone may yet turn up detailed plans someday). For those particularly interested in the details I've included a large-scale scan of the same drawing. Be warned that the file is more than 3Mb in size so it may take awhile to load. I recommend simply saving it to your local drive for further study. Even at 80' in length the ML was hardly a spacious craft. Officer's cabin aft, crew mess and galley, engine room, chart house (over fuel tanks), ammunition locker and crew quarters in the forecastle—all crammed into a space thirteen men had to live in, sometimes for days at a time. In a sense, the Motor Launch was really built around the engines supplied by the Standard Motor Construction Company. Engine choice had been made before the hull was ever designed - based upon Standard's previous experience with this particular engine type. Also included is a brief mention of the auxiliary power plant that provided electrical power and power to the pumps. What was an ML without weapons? The 13-pounder, lighter 6-pounders, 3-pounders, Lewis guns, Lance bombs, mines, paravanes—they were all tried at one point or another.